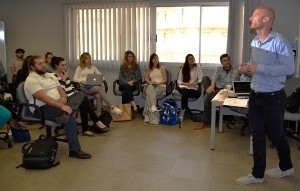 EADA’s current International Master in Marketing participants took part in a class with alumni Jochen Bischoff. Jochen is client solutions manager at Facebook and also works as a communication consultant specialised in digital channels. He completed the International Master in Marketing in 2008 and came back to share his experience post-graduation. Bischorff talked about his role at Facebook, the video platform opportunities for brands and advertisers, and the upcoming digital challenges. In the interview below, we touch on all these topics, and also get into his brilliant career after finishing the master at EADA. What were the most common questions you got from current participants? They asked me about my work on Facebook and the path I took from EADA to my current position. The students were particularly interested in Facebook’s vision for the world, how we react to consumer behaviour and to what degree we shape the world of communication between people and brands. Could you explain your specific position at Facebook? Facebook is a global leader that has had tremendous success in the past years – that’s exciting, and being able to be a part of this system is something I’m grateful for and in no way take for granted. In my role, I lead video as a capability and product across the Middle East, Africa, Turkey, and Israel; this entails both the client-facing monetization as well as driving understanding across all stakeholders in the communication planning and advertising value chain. I work with the world’s largest advertisers across verticals, agencies in both media and production, and internally with anyone from product teams, measurement and analytics teams, to sales units. As a client solutions manager, what are the main customer demands that you see? What innovative solutions can you offer? Clients will always want to buy media at highest ROI and deploy messages in innovative ways that build competitive advantage. In my video role, I play a key role in having clients understand not only the ‘now’, but the ‘what’s next’. For instance, I explain to the advertisers that video content is beneficial for the brands and for the consumer, who need to process the information very quickly. Apart from this, we analyse how to ensure that video content is seen by the right target. How do you explain the remarkable rise in the amount and frequency of video posts on Facebook? The platform is becoming less image-focused and more video-focused by both content creators and advertisers, which means it has more potential and opportunity. We have to take into account that 80% of Internet traffic will be generated through video content by 2019, which again draws the attention to the impact and consumption of this type of content. And what about mobile opportunities? Our world has gone mobile and brands that are just discovering this now are likely to find themselves in catch-up mode over the next years. Mobiles should not be seen as an opportunity, but rather as a ‘must’. As one large CPG’s CMO recently said, ‘No Mobile, no meeting’. What is the future of brand and communication? Our world is changing, mainly due to the platforms, devices, and technology people have access to in their day-to-day lives. The dynamisms of technology shape brand communications faster than ever before, and adapting to this world in the right way is what keeps marketers up at night. Communication and its media platforms have turned from a linear world into a multi-dimensional ever-changing matrix, presenting huge challenges to businesses when choosing the right communication strategy. In your opinion, how do customers react nowadays to brands offers? Like to decades ago, customers nowadays react to brands that are relevant to them and address them in the right channel at the right time – the only difference is that today’s world is much more cluttered and making meaning breaking through this clutter is more difficult. Companies that understand how to leverage big data, addressable media, and creative message distribution in a programmatic world will have an edge. Maintaining this edge requires consistency in granular audience understanding, creative solutions in a mobile world, and staying on top of the latest innovation in media. You are also a communication consultant specialised in digital channels. What are companies’ main concerns in this area? The demand for digital consultancy is higher than ever before, but the development of the digital ecosystem will only increase from here. Companies’ demands range from digital media planning and buying to cultural changes across global corporations. More companies like Google, Netflix, and Uber are trying to understand which components in their model could benefit their own. Before Facebook, you were at Starcom Mediavest Group (SMG), a well-known agency known for working with brands specialised in digital disruption. How would you describe your experience there? I look at agency experience as invaluable to everyone who wants to understand the marketing and communication ecosystem quickly while being able to learn both the strategic and tactical side of planning and buying. Agency business is hard work and can mean long hours, yet the hands on approach required in an agency to move up the career ladder has benefitted me tremendously in my career growth. Before SMG, you did the Marketing plan for Spain’s largest distance seller (fashion and home products). What did you learn there? Working with Venca was interesting in the sense that for the first time in my career, I got to experience what ‘change’ means to companies – and how to drive change consistently without being too disruptive to the brand’s positioning. Why did you decide to do the International Master in Marketing at EADA in 2007? My aim was to get the best education and training in as short a time span as possible while living in a vibrant city that attracts talent from around the globe. EADA over-delivered on all fronts! EADA equipped me with the ambition, knowledge, leadership skills and network I still benefit from until today. What did you learn at EADA that you apply in your daily work? Navigating complex team dynamics and environments while delivering on both short-term goals and a long-term vision – that’s what it is about in dynamic companies that want to succeed, and I feel EADA prepares its student for exactly that! What is the most fascinating aspect of Marketing for you? Driving business results. Marketing is just one discipline in a complex ecosystem, yet with the right strategy, its impact is so clearly visible. Strategizing, executing, and analysing such activity is tremendously fascinating to me, especially in the moment I help brands grow. You are also a professional basketball player. What skills from sports have you been able to transfer to your career in business? Basketball equipped me with the understanding that passion is key to everything, hard work beats talent, teamwork prevails, and that reaching goals is usually not a sprint, but rather a marathon! Last but not least. Have you met Mark Zuckerberg? Facebook is known for its open culture and non-hierarchical corporate climate. Zuck sets the example by living this culture. He steps in front of the company once a week for an open Q&A.